Peaceful Valley Resort nestled in the Rocky Mountains is an idyllic location for weddings. It offers four different ceremony sites: The Austrian-style Alpine Chapel that is built on a mountainside with panoramic views with room for up to 80; the Mountain Top Amphiteater for a roomier, natural setting; The Meadow which is surrounded by aspen tree and a river, and room for up to 250 guests; and The Dance Hall which was built in 1930 and makes for a good indoor back-up if the weather gets rainy. There are also nice weddings reception options, with the Mountain Top having a canopy-covered deck, the Riverside Patio for cocktail hour, and dining rooms. Peaceful Valley Resort is also a dude ranch in the summer, so if the bride or groom want to get on a horse for photos then this is the place. 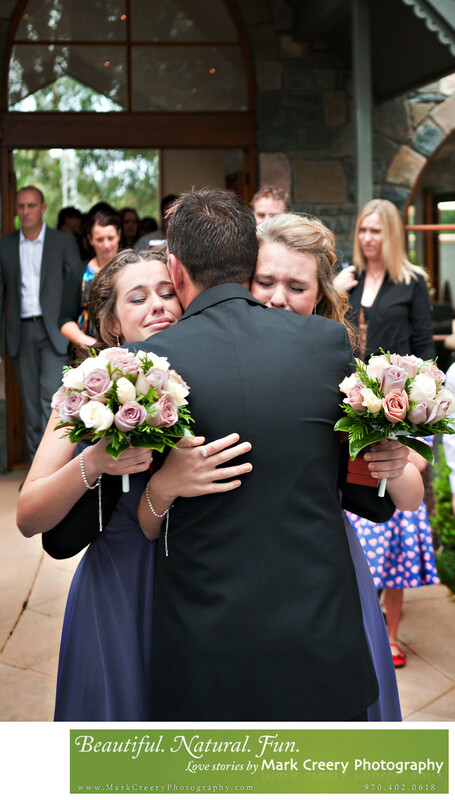 In this photo from one of the over 140 weddings I have photographed, the groom gives a great big hug to his two daughters after the ceremony was over outside of the chapel. This was his second marriage, and the two daughters were overcome by the emotions of seeing him so happy. I love how the girls are both feeling the same emotions at the same time. This kind of candid moment is what I live for capturing at a wedding. Location: 475 Peaceful Valley Road, Lyons, Colorado, 80540.